A breezy, comfortable night tucked back in Mine Creek. Sleeping in the bivy with no boom tent I looked up, at times, to see cloudy skies, hazy skies and clear skies. Up at 5:15 to tie in first and second reefs, there is plenty of wind and the JW pennant snaps at the top of the main mast. With all the wind it might be a wet sail so I put on my foul pants and jacket. Sail off anchor under mizzen and jib at 4.3 kts. close-hauled to the SW wind. Out past Prickly Pear Point we fall off slightly, sailing past the twin towns - fishing villages, really - of Frenchtown and Rumbly, that straddle Goose Creek. 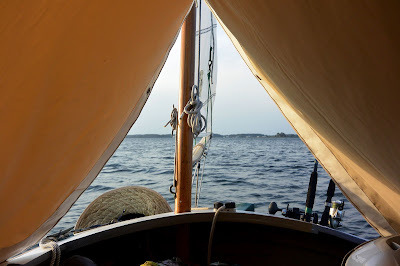 Rounding Rumbly SPARTINA turns up the Manokin River with the sun just above the horizon directly ahead. We make 4.6 - 6 kts passing Drum Point, then 6.7 down the face of a wave, still just mizzen and jib. Up against a dark shoreline of trees and marsh I see two dead rises working the shallows. 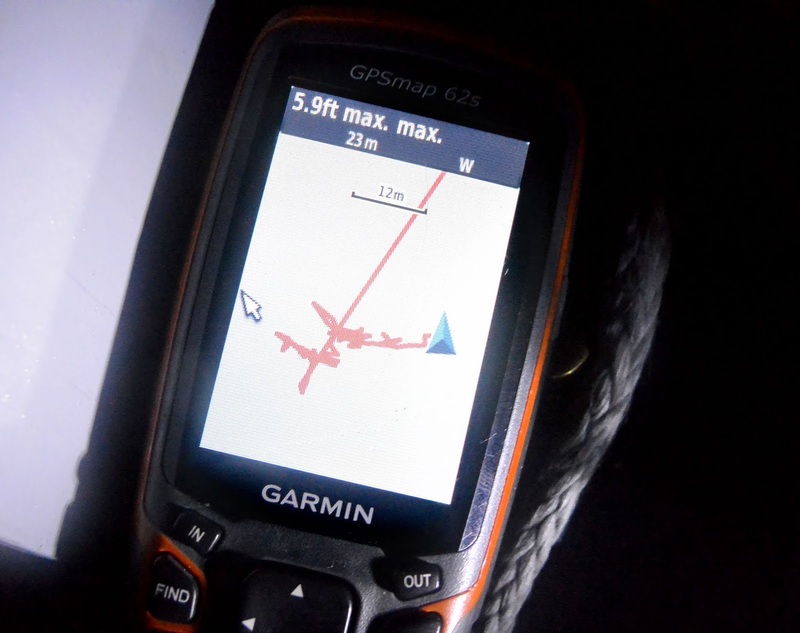 The GPS shows 7 kts. We round Cormal Point, heading west into calmer water and lighter winds, 3.8 kts. I look around to see five creeks - Geanquakin, St. Peters, Back Creek, Wolftrap and Broad Creeks - all coming into the narrowing Manokin River, all wonderful anchorages for future trips. Peaceful, calm and warm - I didn't need the foul weather gear after all - we reach green marker "9", the top of the channel, push the tiller over and turn back down the river. I raise a doubled-reefed main then soon just a single reef. Full sail at 8:40 as the wind falls off, 4.0 kts. The wind continues to drop. Making 1.7 just after 9:00, soon under power. Enough wind to sail by 10:00, 2 kts then 3.0 or better. Three deadrises scraping the grass for crabs near East Point. 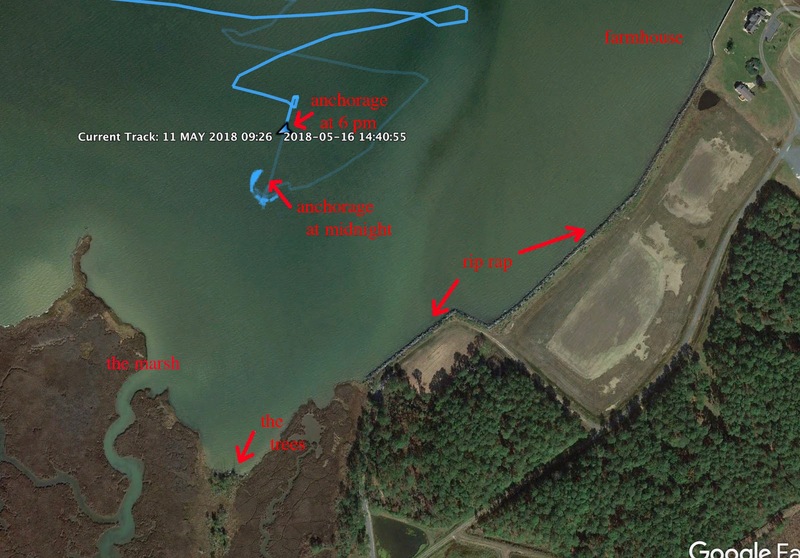 At 10:20 near the mouth of Laws Thorofare, the winding channel through the marsh behind Deal Island, a crabber scrapes with the deadrise Billie Jean, christian music blaring across the water. In the thorofare at 10:30 and it looks to be a welcomed incoming tide. 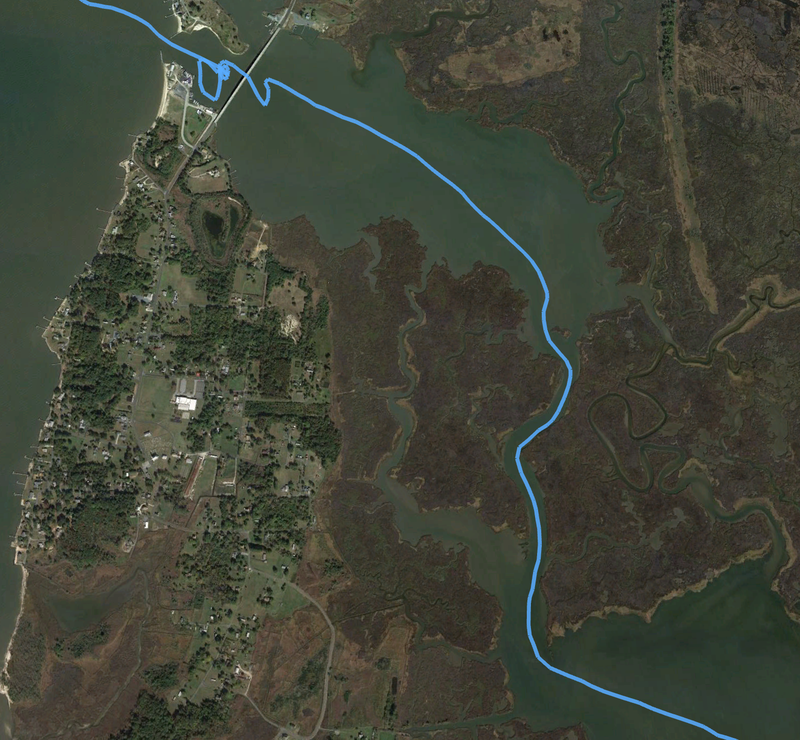 There is a light breeze and we follow the cut through the marsh to the north, then bend to the west before turning back northeast at the narrowest point. Looking across the marsh grass I see the sails of a small sloop. Friends, maybe? The ditch opens to the wide Upper Thorofare and the sloops turns in our direction. Two men aboard, they are visiting in-laws at Deal Island, and out for a day sail in the yellow-hulled Sunbird sloop. We exchange greetings and sail alongside of each other for a few minutes. It feels good to sail with another boat. SPARTINA leaves them behind as we slip under the bridge to Deal Point. 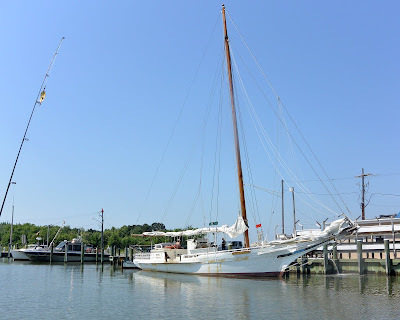 I circle around the basin to enjoy and photograph the classic skipjacks IDA MAY, built in 1905, and KATHRYN, below, built in 1901. Before heading out to Sound I round up to let two deadrises pass through the channel with their day's catch. I'm glad I did wait and watch them, I had misread the channel marker - just an unmarked post - and would have passed on the wrong side. A slow drift through a field of crab pots while I have lunch of tuna, crackers, cup of mixed fruit and some cheese. Just after noon and we leave the crab pots behind, 2.6 toward the Honga River. 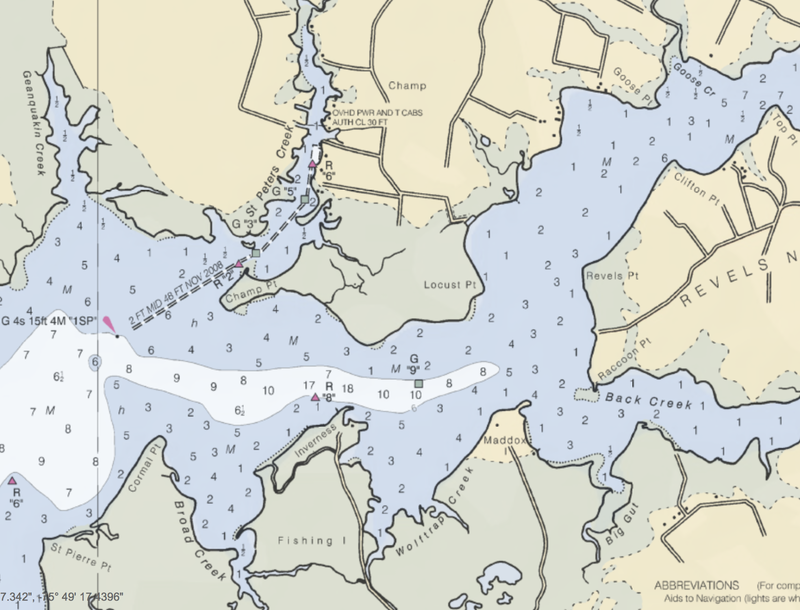 At 1:10 wind is good aft of port beam, gently rolling at 4.4 kts towards Bishops Head. A few clouds in the sky, Bloodsworth Island to the SW, not another boat in sight. Tip of Bishops Head at 1:25, light winds and the sun starting to get hot by 2:00. Wind fills in at 2:30, big deadrises headed in to Wingate with bushel baskets full of crabs. Afternoon breeze for a fine sail into Duck Cove, anchor down 3:45. Time for a nice swim in the surprisingly clear water. 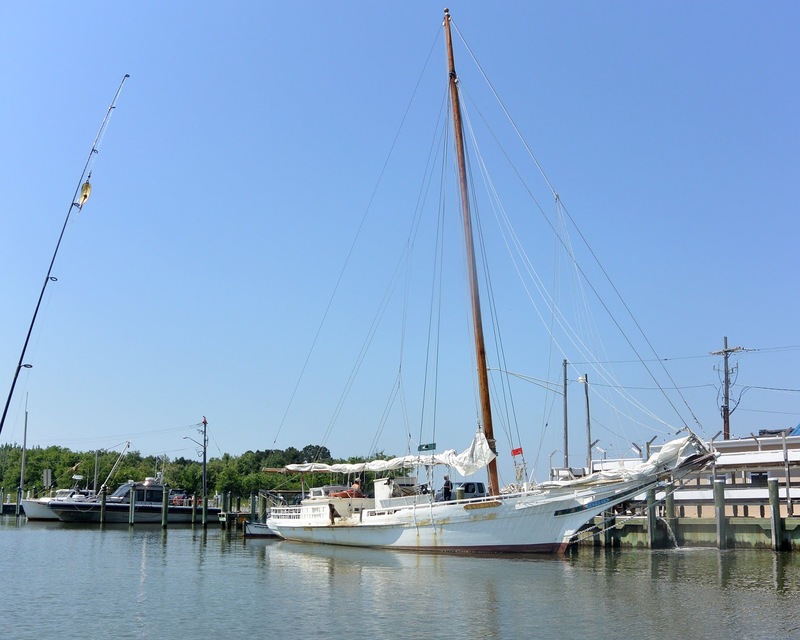 I clean SPARTINA'S hull, take a few photographs, swim beneath the hull to look at the new coat of bottom paint. Just before climbing back on board I walk forward and push the anchor down into the bottom to give it a better set. Dinner of freeze-dried vegetable stew, a double portion but I eat every bite, plus a cup of fruit. I listen to the weather radio, small craft warnings with wind out of the SW, turning late to NE, then back to SW. A call for possible tornado spotter activation in Talbot County, about 20 miles to the north. I don't understand the wind swinging quickly and then back. 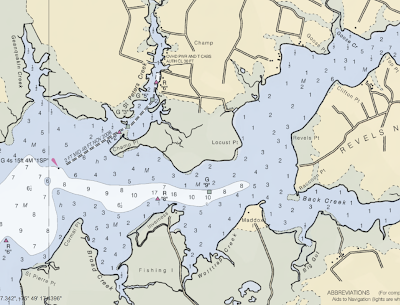 I look at the chart for an anchorage that would give me protection from both directions but don't find one nearby. I decide to stay where I am anchored with good protection from the SW winds. The shift to NE is forecast to be brief and not that strong. I wake from a fitful sleep. Something is not right. I can hear the wind howling outside the boom tent. Anchored in high wind I should feel the bow lift in the steep chop, then drop down with a splash. But that is not happening. SPARTINA seems to be heeling, moving, sliding. It is dark, I have no idea what time it is. I look out the back of the boom tent. It's obvious the boat has swung, the tree line that was off our bow at dusk is now a dark shadow off the stern. Maybe closer than it was when we anchored, I don't know. Lots of lightning. In a flash I see a white pole, but I can't remember seeing a pole earlier in the evening. I reach forward to grab the GPS, but instead I grab the flash light. Glancing aft again, another flash of lightning and I realize the pole is a dead tree, bleached white by the sun and the salt, on the edge of the marsh. I point the flash light out the back of the boom tent and see dead and dying trees, the gnarled roots of more trees laying at the edge of the marsh. They are yards away and we are hurtling stern first towards them. We crash into the trees, the starboard quarter making first contact, then the starboard side is up against the fallen trees and pounding with each series of waves. I hear the sound of wood cracking. I bring down the mizzen. There is no time to think. I slip on pants, shirt and water shoes. I step out into calf-deep water at the port quarter. SPARTINA is rolling back and forth in the steep chop, pounding against the trees. The wind is vicious and lighting is steady. I don't know that I can haul her away from shore but might as well try, there is nothing else to do. 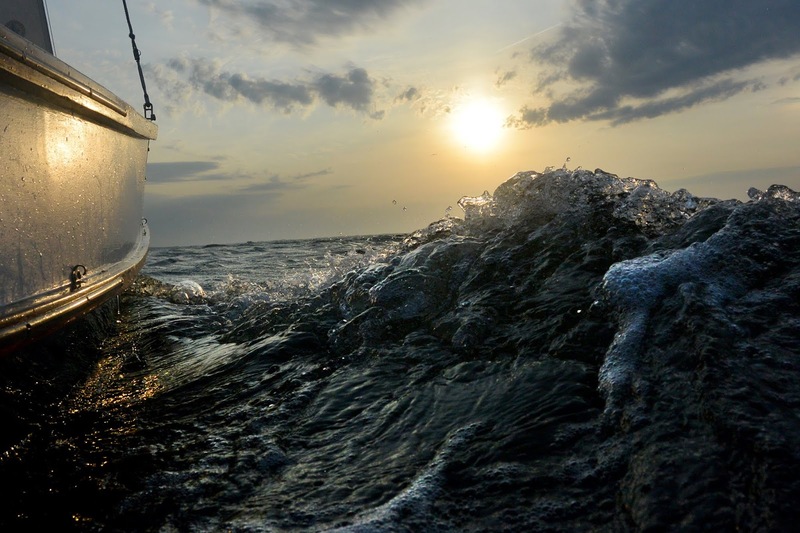 I walk forward to the bow sprit, find the anchor line and start walking forward. It is a struggle but SPARTINA begins to pull away from shore. I now know I've got a chance. I keep pulling her away from shore. Knee deep, thigh deep. Without the mizzen raised SPARTINA "sails at anchor" in the wind, exposing her starboard side, rounding up, then port side, then back again. I can't gain ground when she turns to the side, I can only dig my feet in and fight not to lose ground. Holding the anchor line in my right hand I reach down with left hand, following the line forward until I find the two anchors - a plow style anchor and a mushroom anchor as a sentinel, and the six feet of chain in between - and gather them all up in my left hand. The anchors seem to be off to the right and I don't understand that. One foot after another out in to deeper water. 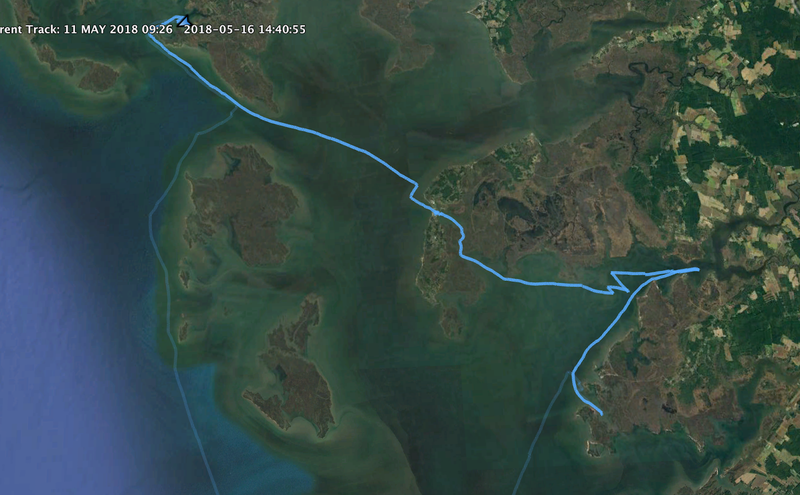 At a certain point, when I think SPARTINA is far enough off the shore, I continue walking forward while paying out the anchor line. SPARTINA holds her place as I stretch the anchor line taught. I set down the anchors and push the plow anchor into the bottom with my foot. It seems to be holding. I walk back to SPARTINA's stern and raise the mizzen. She points into the wind. I walk forward, grab the anchor line and trace it back out to the anchors. Wind, waves, lightning, one foot after another. With mizzen raised SPARTINA pulls forward through the water. Things seem under control but I have lost perception of both time and distance. Had the sun just gone down, or would it soon be coming up? How far off the shore are we? I don't know. I have just two visual points of reference, a light at a farm house to the NE and the marsh that glows yellow in the lightning to the south and west. I worry about becoming cold in the water - hypothermia a major concern - but feel quite comfortable. Maybe adrenaline will do that for you. I'm glad for my swim earlier in the day, I know what the bottom is like and feel confidant walking on the mixture of clay and mud. But the wind is strong, the waves are steep and I wonder if the anchor will, at some point, hold us off the beach. 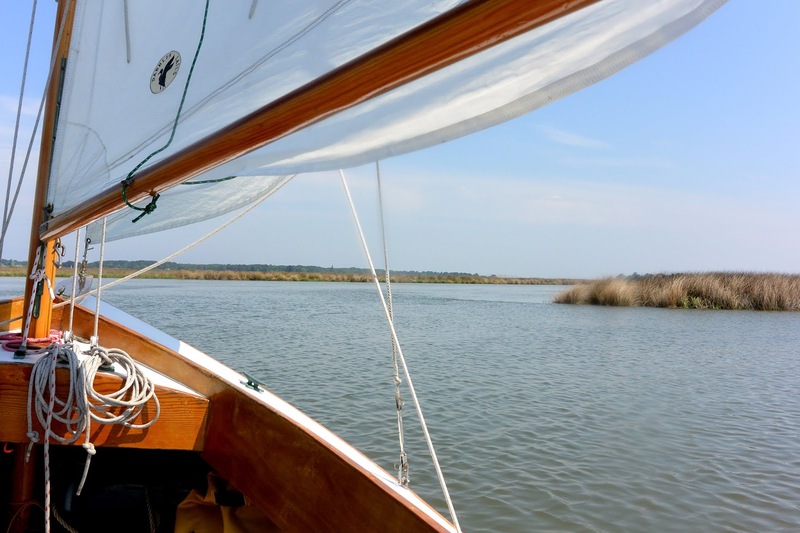 I set the anchors down, press the plow into the bottom with my foot and walk to SPARTINA's stern. I stand there for a few minutes, maybe more, and watch. She is holding. I walk forward to the bow, grab the anchor line, trace the line to the anchors in waist deep water. I lift the anchors. Wind, waves, lightning, one foot after another. I remember a stingray I saw on my afternoon swim and begin to shuffle my feet as I move SPARTINA farther away from shore. Many miles to the north is a steady display of ground strike lighting. The jagged tendrils come down from the sky, trace their way to the horizon and glow brightly when they reach the earth. I look up ahead for the lightning, when it erupts I look back to the line yellow line of the marsh. I remember during the afternoon seeing part of the shore lined with riprap. I can't remember where that was, but off to the west is marsh so I walk away from shore angling to the west. The water is chest deep, chop splashing my neck. Far enough? I can't go much farther. Plow anchor down, chained pulled tight, mushroom anchor down, I walk forward and force the plow into the bottom with my foot. Walking back to SPARTINA it begins to rain. I stand at the stern for a few minutes, the anchor seems to be holding. I run my hands along SPARTINA's hull, just a few scratches, mud and bits of bark. The mizzen and boomkin seem fine. I can't find any damage but I won't really know until morning. The water is too deep, I can't climb into the boat. I reach up to grab the emergency boarding ladder that is tied to the stern clean on the port side. I have sailed with it there for over a decade. For the first time I use the rope ladder to board SPARTINA in an emergency. Back under the boom tent I turn on the GPS. It says 11:44. SPARTINA is moving, sometimes at a knot to more. But that motion is side to side, we are swinging at anchor. The boom tent glows with two quick bursts of lightning. I watch the GPS for thirty minutes to confirm that we are holding. I dry myself off and slip into the bivy. Sleep comes quickly. Scary night, but it sounds like you kept your head! I’m curious to hear if you plan on changing ground tackle based on this experience. Sorry for you troubles, but I loved your report. I never thought I'd see a photo that I would like better than Medusa, but that wave . . . I can't stop staring at it. That must have been quite scary. well handled is what I would say. Brilliant report - thanks Steve. learned lots from re-reading twice. how do you like your soft shells? have you ever wanted to kiss your anchor?